"If only I could have a 'Do Over' "
"There are no Do Over's in life, the past is in the past, and there is no guarantee of the future, so we only have today." I have spent a great deal of time thinking about all of this. 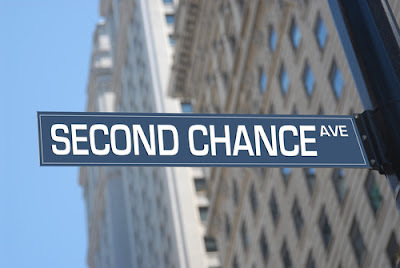 Perhaps I answered too hastily---while there are no Do Over's in life---there are second chances. We can’t go back in time to correct our past actions, but we can make new decisions that move us forward in a way that gives us the sense of a fresh redo. Experience is the best teacher and if we repeat past mistakes and failures over and over---we have squandered our education. 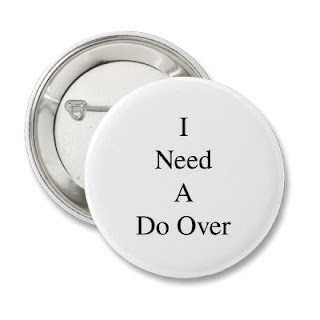 As I read article after article on Do Overs, I found two distinct camps--those who believe in second chances and those who loudly proclaim what is done is done. I will agree we cannot go back and undo the past---it is history. I firmly believe we have the opportunity for a second chance based upon experience and our desire to redeem the past. We have the ability to change the ending of our story. Where did I come up with this crazy notion? The Word---it is filled with examples of Second Chances--Redemption--Do Over's. 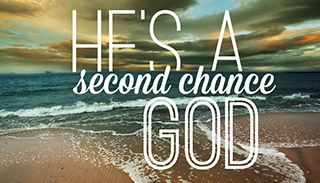 Our God is a God of Second Chances---Praise Him! So take heart---you can turn it around and do it better---you have a second chance! She recovers in hospital and is well again. She is so cheerful that she decides to improve herself. A total do-over (or make-over as we say in the UK). A second chance for her to be someone totally different. A second chance to change all she does not like about herself. She gets plastic surgery done on her face, gets her hair re-styled and dyed a different colour, has lipo-suction to remove any non-wanted fat, gets a new set of stylish clothes and looks terrific once again. So there you have it. Be careful of do-overs or make-overs which make you totally un-recognisable. I intend to be mean-spirited as I ever was. That way people will say "Oh it's him, again ..." and give me a wide berth when they see me. What's the point of me being happy and cheerful all the time? People will think I know something that they don't. And that will make them suspicious. Better we are all miserable together ... what? God bless you, Lulu. Good post today. Perhaps you're right, and I've been wrong all along. Maybe I need a do-over after all. Now, Victor, I don't believe for one minute there is even one mean-spirited bone in your body! Your kindness shines through your writing. No, we can't change history, but perhaps God gives us the chance to redeem our mistakes. Jesus came to redeem us from our past mistakes, and we are instructed before confessing our sins to The Father to go and make it right with the one we sinned against---therefore---I was lead to the conclusion we can have a second chance to redeem and rectify what we consider our failures. Oh yeah, praise God, He gives us 2nd chances, 3rd chances, whatever we need to live more like He's designed us to live. I'm so grateful, Lulu! I sure would hate to be stuck back at square one. NOW THAT IS TRUTH-PREACH ON, SISTER! !